How do you restore a culture? How do you awaken a dormant language? How do you overcome a grave injustice perpetrated by your government against your ancestors when the results of that cruelty still impact your community? The forced removal of hundreds of thousands of Original Americans from their native lands is one of the gravest sins in the history of the United States. Equally appalling was the government’s focused attempt to decimate the culture and traditions of societies that were thousands of years old. It was very nearly the fate of the Miami nation, which hereafter, I will refer to by its native name—the Myaamia people. Myaamia (pronounced Me-AH-me-ah) means “the downstream people.” Historians aren’t entirely sure why, but Baldwin notes that tribal names were often bestowed by neighboring tribes. It’s possible it originated from the tribe’s original location on the Saakiiweesiipi, now known as the St. Joseph River, near South Bend, Indiana. Over time, their lands stretched south to the Ohio River. Over the next several generations, this policy eroded the Myaamia culture and language; the last known semi-speakers of the native language died in the 1970s, and there are only a few words preserved by audio recording. But it is not yet extinct. 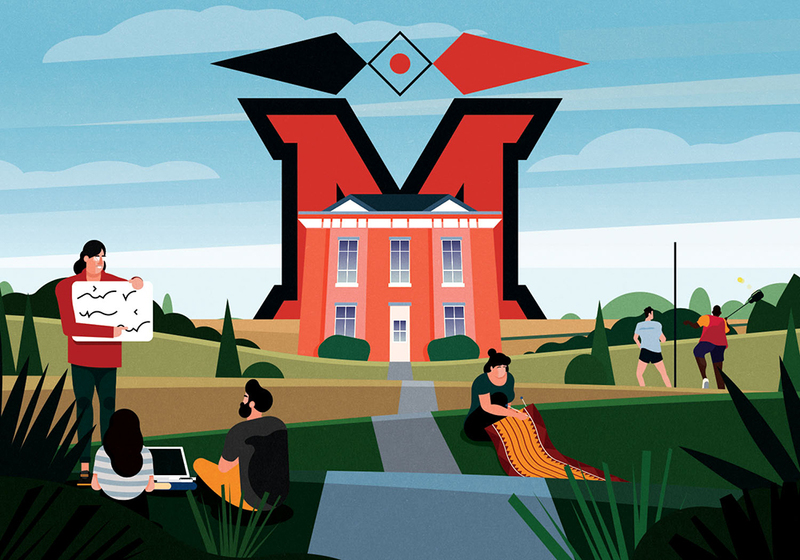 Miami University, the self-styled “Public Ivy” just north of Cincinnati, may not seem the likeliest venue for one of the most ambitious efforts to restore and preserve the history of the tribe from which it derived its very name. Yet that’s exactly what’s happening at the Bonham House, a two-story brick building in the heart of the Oxford campus, the epicenter of a determined effort to bring the Myaamia way back to life. They hired me because I read French,” Carole Katz laughs, “but I never thought I’d get to do this.” Katz is the language document transcriptionist for the Myaamia Center. She points to the computer screen in her office, glowing with high-quality photographs of three early 18th century manuscripts written by French Jesuit missionaries. These are, in effect, pages from the first Myaamia dictionaries, arranged alphabetically and depicted phonetically through a French spelling technique as heard by the missionaries. To understand how Miami University got these manuscripts and why the reawakening of the Myaamia culture is happening here, one must go back to a 1972 business trip to Cincinnati and an apparently spur-of-the-moment decision by Myaamia tribal Chief Forest Olds to drop by campus. Chief Olds, who lived in Oklahoma where the tribe had been relocated a century earlier, popped in to President Phillip Shriver’s office unannounced, and though likely disappointed to find that Shriver was traveling, arranged to meet him later. Shriver himself was a historian, and the two apparently clicked when they finally did get together, according to Julie Olds, the tribe’s cultural resources officer based in Oklahoma. The late Chief Olds was a great uncle of Julie’s husband. That the chief of the Myaamia came to the university to learn about his people’s history and culture exemplifies just how shamefully successful our country’s efforts to erase our native past had been. President Shriver, to his credit, welcomed the chance to establish a relationship with the tribe, a bond that developed gradually through the 1970s and 1980s. Ironically, the university’s first request of the tribe was to support retention of the school mascot and team name—the Redskins. The Myaamias in Oklahoma didn’t have a dog in that fight, but they did agree to help the university depict their tribal pow-wow dance, which was being performed inaccurately at football and basketball games. In 1991, the relationship strengthened as Miami University welcomed the first tribal students to campus as part of a scholarship that came to be known as the Myaamia Heritage Award Program. By 1996, when the tribe had grown uncomfortable with the university’s “Redskins” nickname, they asked the Board of Trustees to change it. Which the board did, becoming one of the first public institutions to recognize and eliminate the pejorative term, a decision unpopular among a number of alumni and students but representative of how respect between tribe and university had grown. The Myaamia Center, first called the Myaamia Project, was established by the university in 2001 and began its ongoing work to resuscitate the tribe’s language and culture while exposing students to its heritage. The research accelerated in 2012 thanks to a grant from National Endowment for the Humanities. “Look at this work,” Katz marvels as she motions toward a page from the 1720 manuscript attributed to Father Jean-Antoine Robert Le Boullenger. “It’s beautiful, isn’t it?” On the left column of the page, Katz points to the French word for “blood,” and then, neatly arranged on the right column, the various iterations of the same word in the Myaamia language. The native list is long, as the priest was careful to show that the word “blood” in the Myaamia language was used and pronounced differently depending on the context. Le Boullenger used French-based phonetics to express the proper pronunciation—or at least what his ear told him. Daryl Baldwin sees all this work not just as an awakening of the language and the culture, but also a restoration of the community. Costa demonstrates the complexity, etching on his whiteboard the Myaamia phrases for “I drink” (meenaani) and “You drink” (meenani). The language is chockful of words with double vowels and their single-vowel cousins. Pronunciation of the double vowel is simply to hold that vowel a fraction of a second longer, a distinction not easily recognized by English speakers. It’s Costa’s job to take the work of Katz and Michael McCafferty, a fellow French translator at Indiana University, and analyze each Myaamian word or phrase. How is the word pronounced? What does it mean? What is the context? There are already more than 40,000 words with more than half of those yet to be analyzed, a project Costa says would take him 20 years if he were to do nothing else. Undoubtedly, there are still more manuscripts to be discovered as well—records go back to 1690, with new Myaamian words written down as late as the 1960s. Costa’s challenge is to figure out how various transcribers over the centuries (some French, some English) heard the language and interpreted it phonetically. With tens of thousands of words—far more than 200—written down, but only five or six recorded on tape, Costa is mindful of his challenge. He doesn’t claim to be reviving the language on his own, either. Costa gets a lot of help from others, including tribal members and educators, some of whom established pronunciation and grammatical precedents decades ago. “There has to be a really compelling reason to go against that,” Costa says, noting with a laugh that no one likes to talk about grammar anyway. Across the hall from Costa’s office, Katz pulls up another manuscript from Le Boullenger’s dictionary, which would make any nun smile. Meticulously organized with straight lines and perfect penmanship, it stood in contrast to the Father Pierre Francois Pinet dictionary, where words were smashed together, crossed out, and rewritten in a mash-up that suggested the writers were in a hurry. Maybe they were. The Pinet manuscript is believed to be one of the oldest known dictionaries, dating back to the late 1690s, and is the product of several authors. Pinet started his missionary work near present-day Chicago but fled to southern Illinois when war seemed imminent. Over the next 20 years, Pinet (and presumably others) added words to the dictionary, which eventually ballooned to 577 pages. Katz notes the dictionary showed “an evolution in the language” over time, and likely contains a mix of dialects. Costa views the Pinet dictionary in another light—as hope that there’s more out there. Pinet’s work was discovered only 19 years ago in the archive of a Montreal church. “It was in a tin box and the church didn’t know what they had or how they got it,” says Costa. “The Jesuits made a lot of enemies, and when they left, they often did so in a hurry. Their manuscripts were scattered and have shown up in Hartford, Connecticut; Montreal; and Providence, Rhode Island.” Costa believes there are more sources to be discovered and is planning a trip to Montreal this summer to rummage through the ancient archives. We know how well-concealed Miami’s documents were, but we don’t know how well-traveled. Is it possible that they survived a hurried departure from the backwoods of the Ohio Valley across the ocean to France, survived the French Revolution, Napoleon, and a second ocean crossing, only to be stuffed in a tin box and stored in the crypt of a Montreal church? There’s no word for that. Baldwin’s son, Jarrid, is a disciple of that awakening. Just five years out of college, he works for the tribe in Oklahoma but is based on the Oxford campus. In addition to helping mentor the 30 Myaamia students enrolled at Miami, he’s heavily involved in the language and culture research. It’s not all work. Jarrid also promotes the historic Myaamia culture by organizing lacrosse games using traditional rules. “They didn’t use a goal and a net. They used this,” says Jarrid as he picks up a heavy wooden pole. “They stuck this in the ground and you had to hit it to score.” There was no goalie, but likely plenty of blood and bruises. “They didn’t use pads, but we do,” Jarrid laughs. The university’s insurance company is no doubt happy about that. On the morning of October 12, 1846, the displaced Myaamia nation marched in an orderly fashion down Cincinnati’s Main Street to the spot where they had disembarked their five canal boats the night before. This walk to Cincinnati’s Public Landing would be the last time their feet would touch the soil of their homeland, Myaamionki. Led by Chief Lafontaine, who The Cincinnati Enquirer crudely described as “a fine specimen of an Indian, measuring upwards of six feet in height, and weighing three hundred and twenty-five pounds,” the group proceeded under guard to the Steamship Colorado for a journey to St. Louis and, eventually, the Kansas Territory. The newspaper reported the mood as joyous, but that was likely 1840s spin. The 555 Myaamia were being uprooted from their ancient woodland homes in northern Indiana to a place beyond their imagination. Their farming-and-hunting rhythm of life had already been disrupted. Their customs and language had been disparaged and attacked. Now they were a spectacle, trudging through the Queen City’s urban landscape to the banks of what they referred to as the Kaanseenseepiiwi, all under the watchful eye of the U.S. Army. It all feels like an ancient story from a timeworn era, despite the fact that the university bearing an Anglicized version of the tribe’s name had already been founded decades earlier. And though proper amends are all but impossible, Miami University has come to embrace the Myaamia culture, eliminating a degrading nickname, welcoming native students, and working hard to restore the language. The school even added two verses in the Myaamia language to its Alma Mater. And just last fall, the university and the tribe took another step forward in their relationship by creating the Myaamia Heritage Logo, a black and red design based on historic native ribbonwork that represents the respect, history, responsibility, and shared vision of the tribal-academic partnership.